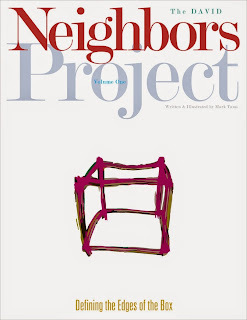 I have just finished working my way through the first book in the new David Neighbors Project series; Defining the Edges of the Box. I wanted to get a review out to everyone before I dive back in for the next round. The quick answer: if you are a coin magician you need this book! This hardbound tome weighs in at an impressive 237 pages and represents just the FIRST of FIVE VOLUMES! The subtitle is a reference to the way David approaches coin magic and acts as a starting point for the trip into David’s head. Like Ed Marlo was to card magic, David is to coin magic. His mind never seems to stop until he has created several solutions to a single problem. And these are not minor variation in the effect. Each solution is unique and approaches the plot from a totally different angle. 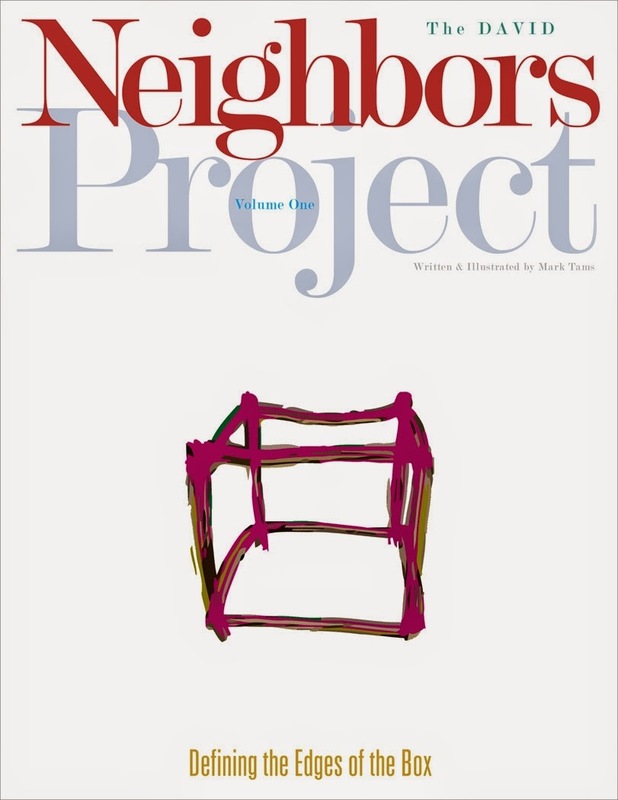 Author Mark Tams' writing is concise and yet marvelously thorough. It is a refreshing style and makes reading the effects easy and enjoyable. The book is broken into 3 distinct chapters. The first chapter, Debut, features 43 complete routines that deal with productions and vanishes. Some routines feature other effects in the midst of the routine, not just the productions and vanishes. A few are variations of an earlier effect, but no 2 are alike and each has it’s own particular strengths and the handlings vary significantly. Some will challenge your skills, some will send you searching for a common gaff, some will send you to the shop to build a simple gaff, while one or two will make you want to ring up your favorite coin engineer for a rush order. The most heavily used gaffs are an expanded shell and the rattle gimmick. Later effects make use of easy-to-make gaffs like a stack of coins, a hooked or magnetic coin, or a fan of 3 coins. A few require slightly more esoteric gaffs like a 2 Copper/1 Silver set or an Ultimate Wild Coin from Todd Lassen. But don’t let this dissuade you, rather reading these effects will strengthen your desire to own these gaffs. Many of the routines can be performed in the hands. Some use a table, but you don’t need to be seated, which fits perfectly into our most common performing situation, standing. Whenever a gaff is required Tams gives a very thorough description of the coin to assist newer coin guys and gals in procuring them and understanding their nature before committing to buying them. This really helps you to visualize how the routine plays and again makes you want the gaff even more! The second chapter Under A Spell takes you through 12 routines based on the Spellbound plot. The chapter starts with a brief history of the Spellbound effect. Again the handlings and effects cover a wide range of presentations and handlings. No two effects are alike. This section also introduces a number of wonderful new sleights like the Visual Toss Change and the Visual Drop Change. Chapter three, Through and Through, opens with a detailed history of the Coins Through The Table plot and really shows off David’s creativity and the lengths his mind goes to when exploring an effect. There are sitting versions and standing versions. There are versions that use a single shell and others that employ an arsenal of gimmicks. There are international versions, using coins from different countries. There are versions where the coins travel down through the table the back up again. There are versions done on a glass tabletop. And yes, there are even international versions that are done on a glass tabletop! Whew! There truly is something for everyone in these pages. The creativity, massive amount of information, and wide scope of this book make it a must-have for ALL coin workers from beginners to experts. Highly recommended! For every single popular coin routine in magic there are probably 20 hidden treasures, effects that are fantastic and look like real magic, but for any number of reasons did not make it as big as I think they should have. 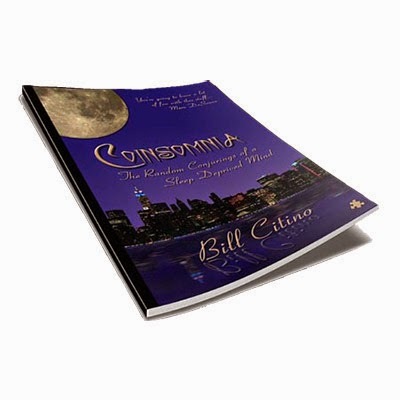 "Money Doesn't Grow On Trees" from Bill Citino's Coinsomnia - The Random Conjurings of a Sleep Deprived Mind is a tight 3-coin production and vanish with a very nice bit of misdirection at the end. As the third coin is produced, it vanishes taking the first two with it! I have been using this for my restaurant gigs lately and the reactions are fantastic! It's quick and clean and really gets people's attention. It plays perfectly as an opener for table work because you control the pace of the effect. The routine includes a reproduction of the coins, but I like to end at the complete vanish of the 3 coins then move into another effect. There is no odd hand-washing or weird gimmicks to control which gives the routine a nice pure feeling. It's everything you could ask for in a coin routine. The link above is to show you more about the book and the awesomeness inside. If you want a copy you can get it directly from Bill for just $25 (a steal!). Email Bill at citino93 @ hotmail.com, you'll be glad you did!